The monks of the Famen Temple try to dismantle the wall to be built at the temple gate. A temple housing one of Buddha's finger bones has reopened after it shut on Friday in protest at a plan to include it in a Buddhist-themed park. According to the local government's plan, the Famen Temple in Fufeng County, Shaanxi Province, was also told to move the priceless object - the veritable finger bone of the Sakyamuni Buddha to a new pagoda outside the temple. The Famen Temple said on Friday that a construction team for the Famen Temple Cultural Scenic Park built a wall in front of its gate blocking the temple's vehicles and infringing its rights. The temple closed its gate on Friday afternoon. It reopened the next day, but conflicts between the developer and the temple remain unresolved. The temple used to collect 28 yuan (US$4.10) each from tourists and allow local pilgrims to enter free for daily worship. However, the ticket price for the planned theme park would be as high as 180 yuan with no free access, according to one of the temple's monks. Workers started building a high wall to fence in the park on Friday but met strong opposition, with some monks trying to push it down. 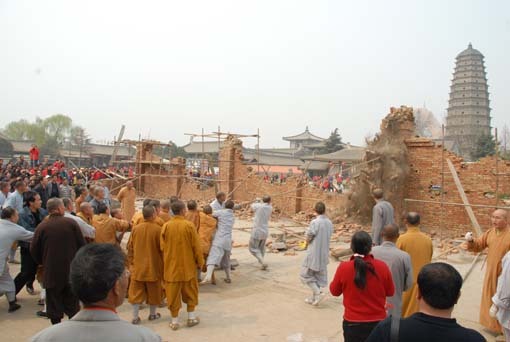 There was a misunderstanding between the developer and the temple management, said Zhang Ninggang, deputy head of the Shaanxi Provincial Administration for Religious Affairs. "The developer of the park and the temple management have reached an understanding," said Zhang. "The tourism service runs as normal now." However, the monk said the government wished to boost local tourism and did not care about local residents and honest pilgrims. Construction of the park started about a year ago and the temple supported it at first as they had no knowledge of the wall or ticket details, the monk said. The Famen Temple tourism administrative office said there had been no decision on ticket prices. Archaeologists found the finger bone with 2,000 other relics in a 1,000-year-old underground hall in Famen Temple in 1987. The Sarira, or remains, were confirmed to be the finger bones of Sakyamuni, the founder of Buddhism.